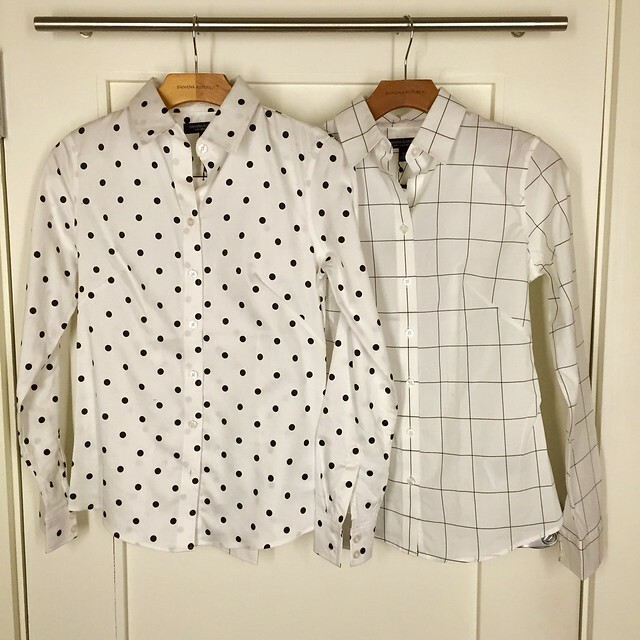 I purchased the fitted non-iron windowpane shirt pictured on right from Banana Republic tonight and I can’t remember the last time I’ve been this smitten with a button down shirt. I found both of these shirts in the sales rack for $54.99 and with the additional 40% off sale items it came down to $32.99 while they’re still full price online. I think the store locator doesn’t work well on sale items as I know there is still at least one polka dot blouse left in size 0 at the store I visited tonight. I usually shop at Banana Republic online for all of my husband’s clothing but if my memory is correct Banana Republic‘s in store style number and the online style numbers are different. Unfortunately, I only purchased the windowpane version so the item number on the receipt for that shirt is 066323. I found regular size 0 fit me perfectly (click here for my size reference) but I noticed that the dot version seems slightly more fitted than the windowpane version. You can see the difference in fit from the side by side picture above despite both shirts being the same size and style. I prefer a more relaxed fit so I hemmed and hawed and ultimately purchased the one I figured I’d wear more. Even though the dot version is really cute I won’t reach for it as much if I don’t feel comfortable in it. On the hanger you can see that the dot version of the shirt is not see through while the windowpane fabric is thinner. I buy these non-iron shirts for my husband quite often and they wash well in cold wash. I always shake out and hang the shirts to air dry after using the ‘air dry’ (no heat) setting on our dryer to further de-wrinkle. It also helps to prevent wrinkles in general if you don’t let your wet clothes sit in the washer for a long time. Really like the windowpane shirt on you. Can't wait to see you style it.